In our continuous efforts to making Zoho CRM available on all mobile platforms, we are excited to announce the immediate availability of our dedicated iPad app for Zoho CRM in the iTunes App store. The iPad app for CRM (a Universal app now for iOS supporting both iPhone and iPad form factors) is designed and tailored specific to iPad dimensions and dynamics blending power and ease of use together. We have conceived the design for this app keeping simplicity of data access and data entry at the fore-front. We have used real-world objects like Wallet & Business Cards to represent contact information, which will help users relate to information and act upon them instantly. The iPad app comes readily optimized for the Resolutionary New iPad featuring the gorgeous Retina display with access to core set of features as detailed below. Note: The app is free to download from the App store but users need to subscribe to the Mobile edition of Zoho CRM to use the app. A FREE, full-featured, 15 day trial is offered to test the app before subscribing to the mobile edition package. Enterprise edition users get free read-only access to the app post the trial period. Try our apps and let us know what you think – you may use the “Feedback” option present within the app or email us at support@zohomobile.com. I noticed no reply on the Andiod question. Any possiblitly of that app in the works? Excellent! Now if only there was an app for ZOHO Reports! You guys just rock! this is a super app. I can’t believe you got it this right on your first release. A few helpful features would be ability to see related contacts for opportunities and be able to log calls from contacts / leads directly. Perhaps a logged call when dialing number on skype. In addition, being able to download additional records (more then 200) for fast offline access would be great too. This is just a great app already – looking forward to seeing it improved. Keep up the good work. I am already an enterprise user (worksflows rock) and have implemented several CRM’s in my time. Your product / company is outstanding. Please, a very important request is to preview account name in potentials list. Now, there is no way to guess to which account belong a potential. Great job guys. Thrilled that you’re constantly making efforts to improve this already fantastic CRM solution. We’re only a husband and wife team so we use the free version but were quite happy to pay for the mobile edition because it’s worth the investment. For such an incredible system, incl regular developments such as this, I think they should expect to dip their hands in their pockets just a bit and contribute towards (in this case mobile Edition) development. Thanks for helping us with our small business!! I have been enjoying using your CRM for about a week now. 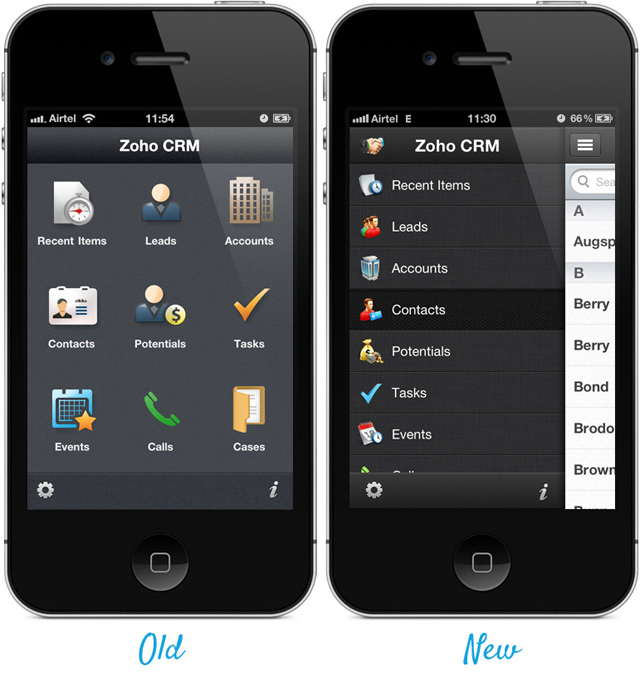 How can I log in to the Zoho CRM for iPad, if I’m using Google Apps to access Zoho CRM? I have tried my email and username but it won’t accept my password. Based on what I see here, the Zoho app will not meet my needs. 1) It requires a “subscription to the mobile edition of Zoho to use the app” 2) The main reason I would use it would be convenience to issue an invoice while traveling, which I would need to export as PDF to be able to send. Since there is no mention of this capability, I assume it does not exist. My conclusion is that if I want to use Zoho while traveling? Just take the laptop along.